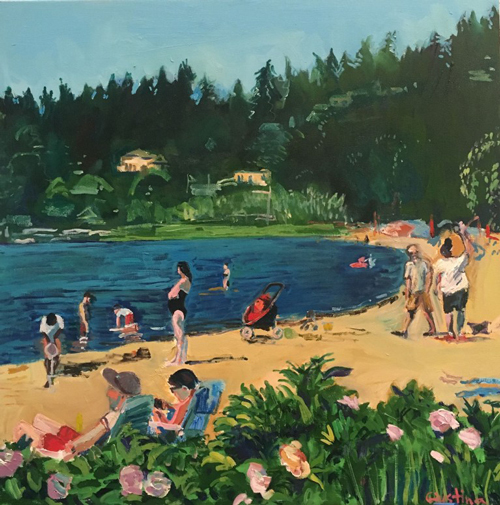 Archival Gallery presents In the World of the Living by Robin Leddy Giustina on exhibition April 4-27, 2019. Also showing sculpture by Eryle Swanson and Debra Kreck-Harnish. Robin Leddy Giustina includes works based on sketches made at Water World in Sacramento as she floated lazily in a tube on the river. She enjoys people watching and connecting the past with the present. Eryle Swanson’s delightful clay sculptures complement this exhibition with high-flying rabbits on trapeze and twirling rabbit ballet figures. Debra Kreck-Harnish’s Tutu Much Fun series of sculptures will be on-display, crafted from hand-made and printed papers, maps of the Sierras, and vintage ephemera. These sculptures range from 14″ to 36″ tall and are presented on integrated display stands.